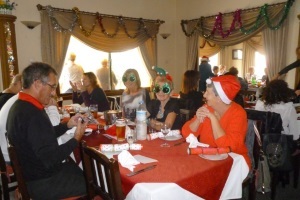 The Doganköy Community Association held a pre-Christmas lunch on Wednesday 17th December at Al Shaheen Restaurant in Karakum which was a very enjoyable afternoon with a choice of starters and a main course of Turkey with all the trimmings. There was an option of a curry but I suspect most people opted for the traditional Christmas dinner. 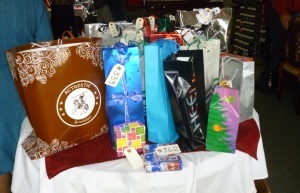 There were many raffle prizes displayed on a table and tickets were selling like hot cakes. Ian Fell came around to the tables to inform everyone that if the guests would like to donate 5TL and any loose change, there would be a special prize which would take the form of a “heads and tails” game. We all wondered what was in store for us. 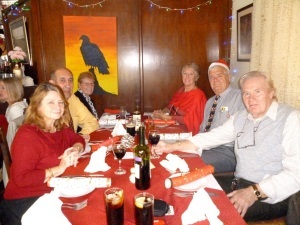 The restaurant was full to capacity with about 67 people attending so the air was buzzing with conversation and jollity. 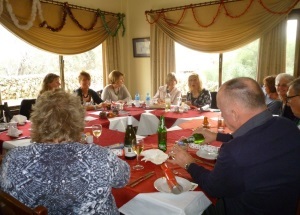 Following the meal the raffle was drawn and the prizes slowly reduced as people took the surprise package given to them. Then came the game, everyone had to stand and either put their hands on their head or on their rear end and at the spin of a coin it was heads or tails. There was a bit of confusion as to which call was to sit down or remain standing, resulting in a lot of laughter, but eventually it was decided to be a dummy run and then the serious game started and continued until there was only one person left. The Doganköy Community Association are doing a lot of fund-raising for the maintenance and preservation of the lovely old church in the village and we were pleased to be told that the lunch event raised 1,500TL for their funds, which is a brilliant amount. Many thanks to Paula and Incilay for organising this wonderful event and to Imtiaz and the staff at Al Shaheen for looking after us so well. This entry was posted in Special Events and tagged Al Shaheen Karakum, Charities and Associations, Dogankoy Church, Dogankoy Community Association, Entertainment, North Cyprus by kyreniacatkin. Bookmark the permalink.